Join over 10,000 organizations in 30 countries by adding one of the 9/11 Patches to your uniforms, job-shirts, bunker gear or jackets. Click the button below to see some of these organizations. 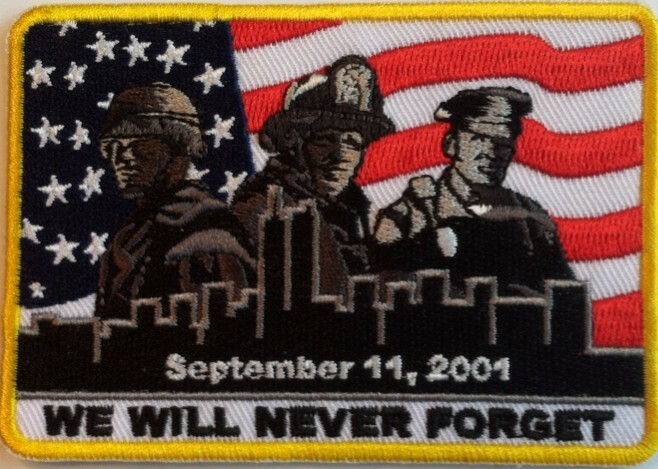 Since December of 2001, the 9/11 Patch Project has been about getting one of the 9/11 Patches on the uniforms, job-shirts, turnouts or jackets of all Fire Departments across our nation, to honor and remember the heroes of 9/11. Since the project began over 10 years ago, 10,000 organizations in 30 countries have stepped up to show their support. The project has also been about keeping a promise to NEVER FORGET and about raising funds for 9/11 related organizations such as the NYC Bravest Scholarship Fund, the Terry Farrell Fund and the Feal Good Foundation. Why add the patches to your uniforms? It's understood that some uniform standards out there may preclude adding the patch to uniforms. 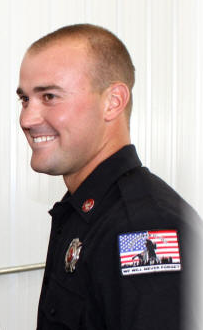 That is why the 9/11 Patch Project is calling for organizations to get the patches on any item of clothing worn on duty such as; job-shirts, turnouts or jackets. _Original 9/11 Patches- Click "Add to Cart" button below image to purchase now. This patch is meant to go on a uniform shirt, job-shirt, jacket or turn-out coat. The patches will not fade, shrink, run or shrivel up. This patch measures 2 1/2" X 3 1/2". Allow 3-4 weeks for delivery. 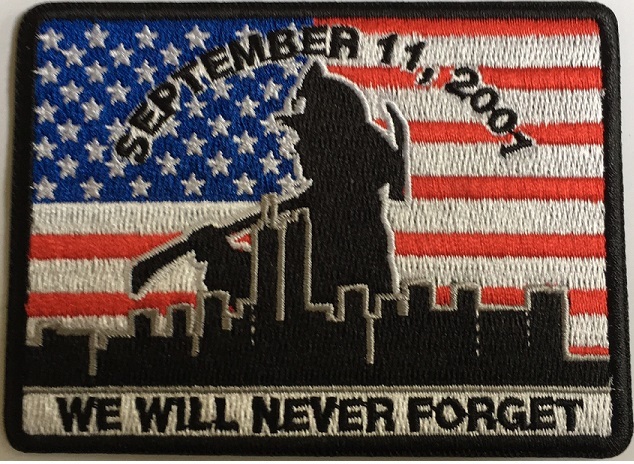 Original 9/11 Patch- Click "Add to Cart" button below image to purchase now using paypal. This patch is meant to go on a uniform shirt, job-shirt, jacket or turn-out coat. The patches will not fade, shrink, run or shrivel up. This patch measures 2 1/2" X 3 1/2". Reverse Original 9/11 Patches- These are the right sleeve versions of the patch that allows you to wear the patch on your right side with the "stars leading." This patch is meant to go on a uniform shirt, job-shirt, jacket or turn-out coat. The patches will not fade, shrink, run or shrivel up. This patch measures 2 1/2" X 3 1/2". Allow 3-4 weeks for delivery. run or shrivel up. This patch measures 2 1/2" X 3 1/2". 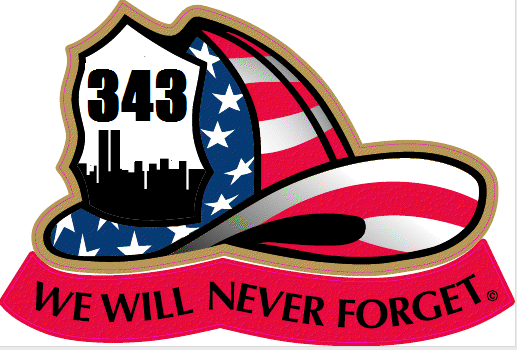 9-11 "343" Helmet Patch- This is our latest patch that was just released. This patch is meant to go on a uniform shirt, job-shirt, jacket or turn-out coat. The patches will not fade, shrink, run or shrivel up. This patch measures 3 1/2" X 2 1/2". Allow 3-4 weeks for delivery. 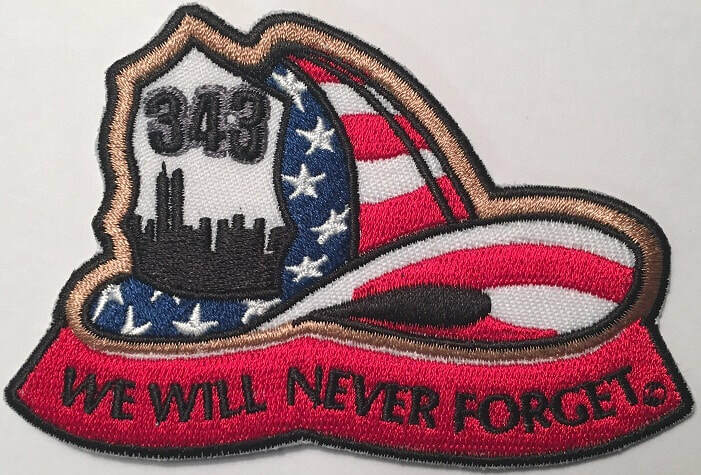 9-11 "343" Helmet Patch- This is our latest patch that was just released. This patch is meant to go on a uniform shirt, job-shirt, jacket or turn-out coat. The patches will not fade, shrink, run or shrivel up. This patch measures 3 1/2" X 2 1/2". 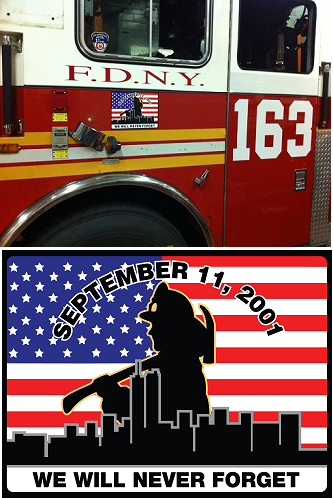 9/11 Apparatus Decal (Default version or "Stars Left") Measures 8.5" X 11". As seen here on FDNY Fire Equipment, the decals are large, bright and fade resistant. They are also made of a tough heat and peel resistant 3M decal product. The Left decal (pictured) is the default with stars on the left (Driver Door, front or rear of vehicle) The Right decal has the stars on the right (passenger side). The "Right" version is not sold separately but can be ordered as a Right and Left pair (next one over). 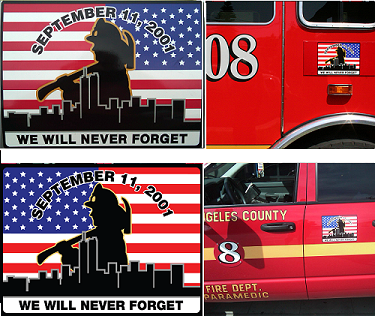 9/11 Apparatus Decals (Right and Left pair) Measures 8.5" X 11". 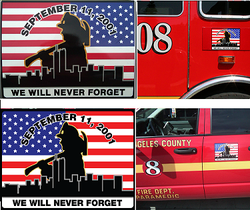 As seen here on LA County Fire Equipment, the decals are large, bright and fade resistant. They are also made of a tough heat and peel resistant 3M decal product. The Left decal is the default with stars on the left (Driver Door) The Right decal has the stars on the right (passenger side). Black 3-Heroes 9/11 Patches-Redesigned and improved! This patch is meant to go on a uniform shirt, job-shirt, jacket or turn-out coat. The patches will not fade, shrink, run or shrivel up. This patch measures 2 5/8" X 3 3/4". 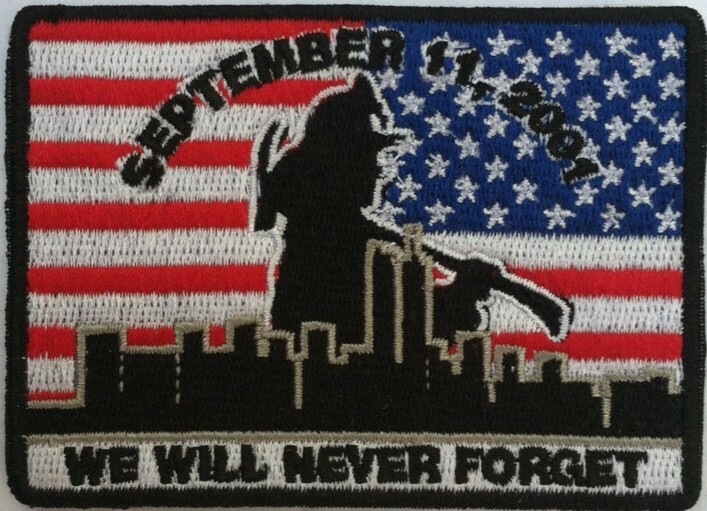 Black 3-Heroes 9/11 Patches-Redesigned and improved! This patch is meant to go on a uniform shirt, job-shirt, jacket or turn-out coat. The patches will not fade, shrink, run or shrivel up. This patch measures 2 5/8" X 3 3/4". Get as many quantities of 100 as you need (e.g. select "2" to purchase 200 patches). Allow 3-4 weeks for delivery. Gold 3-Heroes 9/11 Patches-Redesigned and improved! This patch is meant to go on a uniform shirt, job-shirt, jacket or turn-out coat. The patches will not fade, shrink, run or shrivel up. This patch measures 2 5/8" X 3 3/4". Check here from time to time as we will occasionally offer these patches in singles. Gold 3-Heroes 9/11 Patches-Redesigned and improved! This patch is meant to go on a uniform shirt, job-shirt, jacket or turn-out coat. The patches will not fade, shrink, run or shrivel up. This patch measures 2 5/8" X 3 3/4". Get as many quantities of 100 as you need (e.g. select "2" to purchase 200 patches). Allow 3-4 weeks for delivery. The 9/11 Firefighter Flag is full size (3 foot X 5 foot) and is single layered. Both sides of this flag are equally bright and detailed. The flag is printed on a newer UV screen printer to reduce fade. Please allow 2-3 weeks to receive your order. 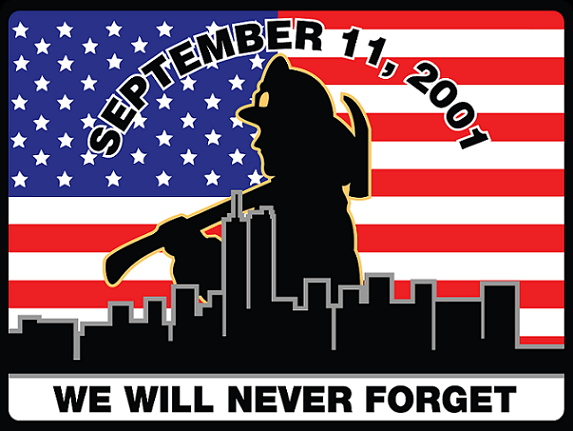 9-11 Helmet Window Decal: This decal is a 3M fade resistant decal that measures about 2.5" X 3.75" and is meant to go on the outside of a vehicle window. We have seen some of these out there last over 10 years and still hold their color. 9-11 Firefighter Decal: This decal is a 3M fade resistant decal that measures about 2.5" X 3.5" and is meant to go on the outside of a vehicle window. We have seen some of these out there last over 10 years and still hold their color. The decal is about the same size as the matching patch. 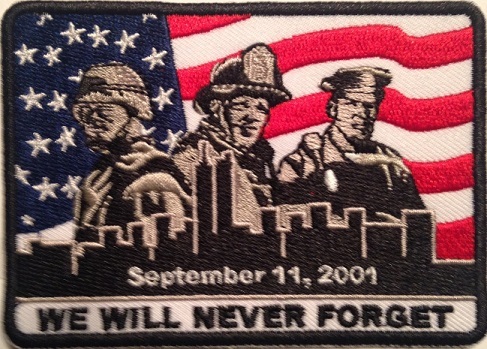 Become a 9/11 Patch Project LifeTime Sponsor: Join Chicago Firefighters, Rockford Firefighters, Philadelphia Firefighters, Baltimore Firefighters & Beverly Hills Firefighters.